Well, a rocketcycle, to be precise. 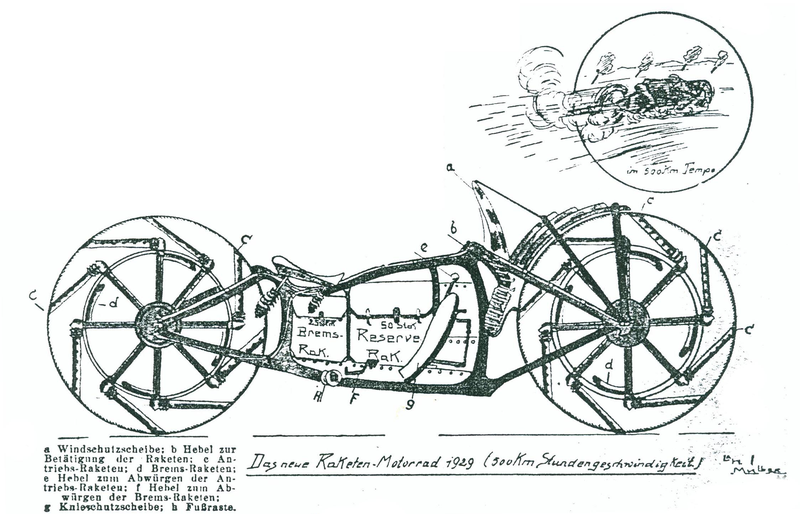 Undoubtedly inspired by the popular success of Max Valier's rocket cars and rocket sleds, the inventor decided to use rockets to power the wheels rather than propel the bike directly. In a magazine article titled "The Rocket Drive," he suggested placing eight solid-fuel rockets (to be supplied by Friedrich Wilhelm Sander, the same pyrotechnics manufacturer that created the rockets used by Valier) tangentially in the rim of each wheel. The inventor also thoughtfully provided a supply of reserve rockets as well as rockets for braking (the "Brems-Rak." in the diagram), though how the latter were to have been applied is a little unclear. It was hoped that the thing would reach speeds of up to 500 km/h (over 300 mph), which would certainly have been exciting. It's possible that the accompanying illustration showing the bike and rider heading off into space (to a crowd of terrified-looking spectators) might not have been terribly far off.